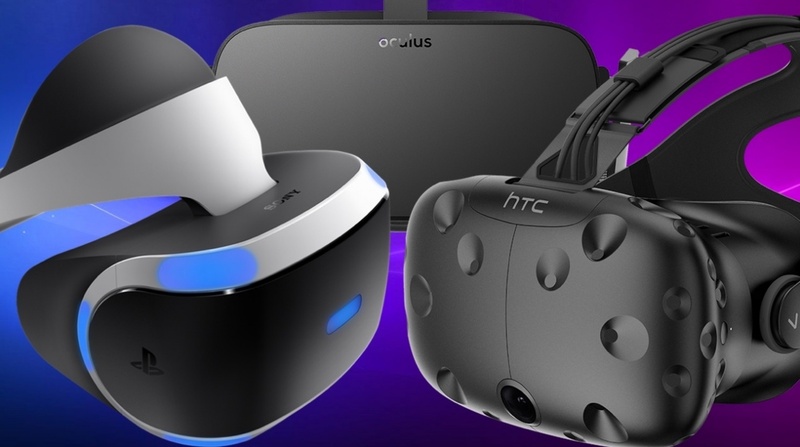 Virtual reality is well and truly here, and in 2019 there's a big collection of VR headsets to choose from, from high-end PC-based setups to standalone headsets all the way down to mobile VR. But which is the best VR headset out there right now? For our money it's the Oculus Rift, as better games, Touch controllers and the addition of room-scale tracking have come together to make this the most polished, high-end VR experience around. But the competition is closer than ever. Vive is also excellent (and still offers the best room scale), while the Sony PlayStation VR is a big seller thanks to its significantly lower price and the ubiquity of PlayStation 4 consoles ready to run it. So what are the best VR headsets – and which one should you head out and buy? We've put together the definitive selection of the most gob-smackingly awesome devices just waiting to be strapped to your face. This group is what most of the fuss has been about. The Oculus and HTC both work with a PC, while the PlayStation VR works with a PlayStation 4, so your choice of headset may come down to whatever machines you already have. If you're going for a PC headset, be sure you have good enough specs to run it. Touch has moved from a nice addition to a must-have Oculus accessory. Sure there's an Xbox One controller you can use, but Touch actually brings your hands into VR, using the combination of sensors and buttons to perform gestures like giving a thumbs-up or pointing your finger. Leap Motion has been around for a while but now it's got a new lease of life as a VR peripheral compatible with both the Rift and HTC Vive. It attaches with an add-on mounted to the front of the headset and adds hand gesture controls to your virtual reality gaming. It's super precise, tracking each finger – the question is, how precise are your dumb human hands? The Oculus Rift is the headset that started the new age of VR. Developed by Palmer Luckey, funded via Kickstarter and snapped up by Facebook for a cool $2 billion, the Rift plugs into your computer's DVI (or HDMI) and USB ports and tracks your head movements to provide 3D imagery on its stereo screens. The consumer edition Rift uses a 2160 x 1200 resolution, working at 233 million pixels per second, with a 90Hz refresh rate. It's high-tech stuff, and matches the HTC Vive for refresh rate. However, given its access to the power of the latest PCs, it's pushing a lot more pixels than Sony's PS VR headset. The Oculus Touch controllers have made a world of difference since their arrival. Compared to the other headsets' controllers, they're our favourite – they conform to your hand and allow for some finger recognition, like a thumbs-up. Not just that, but when it comes to games Oculus has come on leaps and bounds. That's been largely helped by some developer cash injections from Facebook, giving us quality, polished titles like Lone Echo and Robo Recall. Room-scale support has been added too, though you'll need to purchase at least one additional sensor to get it to Vive-level tracking, and even then the Vive tracking experience is a little better in our experience. But the Oculus Rift platform is finally a finished product that excels at giving you the VR experience the company initially promised. The price is a lot lower now too, especially now that Oculus is including the Touch controllers with every headset from here on out. Oculus VR permanently dropped the price to $399 after a successful 'Summer of Rift' event. Vive's Tracker might not look like much, but stick it on something and that "thing" becomes a controller. Yes, HTC is redefining how we think of mixed reality with this accessory, and now anyone can buy one. Developers have been busily finding exciting and unique ways to use the Tracker in games, which will require mounts for certain props, like guns and baseball bats. Got a regular Vive and don't want to go Pro? Still want a comfortable quality audio experience? For too long, Vive users have relied on the Vive's head strap to secure the VR headset to their faces – this makes for a more comfortable alternative, with built-in audio to boot. The Vive Pro sports a 2,880 x 1,600 resolution on a dual-OLED display, up from the Vive's 2,160 x 1,200 resolution. There's also dual cameras on the front that'll help track your hands and a 90Hz refresh rate with 70 sensors, giving you 360-degree head-tracking. It's not a leap to say that the Vive Pro is a monster. This is easily the most advanced VR headset out there, but it's also incredibly expensive, sitting at $799. If you don't need that added clarity, the Vive has all the same tricks. Vive's best quality is its Lighthouse room tracking, which enables you to move around with the headset on, and it does this better than the competition. Be aware that despite the ability to move around, though, the cable is still a nasty reminder that you're tethered. However, because the Lighthouse sensors need good vantage points to track all your head and hand movements, it means mounting them up high. This makes setup for the Vive a bit convoluted compared to, say, the Rift or PSVR. For the Rift, you can just plop down the sensors on a desk, though to get the same 360 tracking you'll need to buy an extra sensor (the Touch bundle gets you two). However, when you get Lighthouse all ready the effect is next-level – enough to make using the PlayStation VR or Rift feel like a step back at times. At some point the 2.0 Lighthouse sensors will arrive with a new curved design and support to add up to four at once (right now it's just two). Meanwhile, the Vive's Trackers enable you to bring any object into VR, and some developers have already found some creative uses for them. These, combined with the TPCast's wireless adapter, gives the Vive the advantage in the tech battle. However, if you wait a little while you can get your hands on the new Vive Pro Eye, which adds new eye-tracking technology (more on that further below). While the Vive library has got more impressive, it's missing some of the exclusives you'll find on the Rift. Still, there's a lot to explore, and plenty of titles we think are worth your money. HTC is also trying to push its Viveport subscription service, which gets you a whole bunch of VR content for different tiers of monthly fee. You'll be getting freebies every month, with titles you can swap in and out of a digital locker. While the Vive and Vive Pro are technically more impressive than rivals, the Pro itself is incredibly expensive and overkill for a lot of people. If you're interested in some of the hardware in Vive's ecosystem, you may be happy with the regular Vive, which has seen its price drop down to $499. San Francisco studio Impulse Gear, which also developed the VR game Farpoint, created a Sony approved peripheral for the Move controller so you can play its shooter – and others – more naturally. Called the PS VR Aim Controller, the device offers direct one-to-one tracking, letting you aim just as you would in real life. It looks and works similarly to another Move peripheral from the past with its thumbstick, directional pad and bumper buttons. Though this design is sleeker, more futuristic and feels better to hold. PlayStation VR will be a lot of people's introduction to 'good' VR. It's not perfect, but it's going after console gamers hard and, ultimately, it is still a truly awesome VR experience. There's nothing else in this category of 'quality but affordable' VR, meaning PS VR is the benchmark for mainstream console VR. Having now sold more than three million headsets, Sony is at least winning the VR war on sales and we're expecting it to maintain that momentum through the end of 2018, with both familiar franchises and new IPs on course for PS VR. The lineup of games is looking pretty strong going into 2019, with games like Beat Saber,Resident Evil 7, Doom VFR, WipeOut Omega Collection,Skyrim already garnering strong praise, alongside plenty more. Setup for the PS VR is relatively simple compared to the Vive and Rift – the majority of the work is just plugging wires into the right ports. The PS VR, like the Vive, uses a halfway box where all the wires go. There's also just one sensor here to worry about, largely because most of the PS VR experiences are meant for sitting or standing in one position. Despite being one of the big three in high-end VR, the PS VR is a noticeable step down from the Rift and Vive. It's got a 120Hz refresh rate, which is higher than the others, but it's not as crisp with its 1920 x 1080 resolution, which means things are a little more blurry. Plus, its PS Move controllers feel very long in the tooth; they're repurposed motion controllers from the days when the Nintendo Wii was popular, and feel very outdated when compared to the Rift's Touch controllers. Compared to the Vive and Rift, the PSVR has a lower barrier of entry as you don't need a high-end PC to use it – just a PS4. So it's no surprise that PlayStation VR has outsold both HTC Vive and Oculus Rift even if, by its own admission, the tech isn't quite up to the standards of its competitors. Microsoft's plans for virtual reality aren't what you're used to. Rather than go for a straight VR platform, Microsoft is investing heavily in a platform it refers to as mixed reality. And, since it's Microsoft, it's partnering with a bunch of third parties to make it happen, like Samsung, Lenovo and Acer. Windows Mixed Reality is aimed at creating a more affordable version of high-end VR, and many of the headsets are built to run in two modes: one for PCs with dedicated graphics cards and one for PCs with integrated graphics. Many of these headsets start around $300, but at the top of the pile is the Samsung Odyssey. It has built-in spatial headphones from AKG, two 1400 X 1600 AMOLED displays, and a 110-degree field of view. One place Microsoft has succeeded in how easy it is to set up its WMR headsets. It uses inside-out tracking, so you won't need to go plug in a bunch of sensors to make sure your headset is being seen. These headsets have built-in cameras and sensors that handle all of that. They'll even track the Windows Mixed Reality controllers, which suffer a bit because they rely on the headset being able to see them clearly to properly track. Do remember that it's still early days for WMR, and you can tell by the number of experiences available. Cliff House is a pretty cool home area to roam around, but there isn't the amount of great experiences that Vive, Rift or even PS VR offer at this point in its lifecycle. Hopefully that will improve as the months pass. In our hands-on time with the Odyssey, we felt it was the one Mixed Reality headset that's on the same level as Oculus Rift. It has a premium, comfortable feel that the other headsets, from the likes of Lenovo, Acer and HP don't have. For Windows Mixed Reality right now, Samsung holds the bar. It's time to ditch the cables. If the idea of having a VR headset that has to be plugged into a PC or powered by your own smartphone, these are the headsets you want. Thankfully there's some strong options out there that offer a halfway house between the best smartphone-powered VR headsets and the top end options that need a PC to run them. Oculus Go could become the best attempt at mainstream VR yet. It's got a big company behind it in Facebook, and it's a standalone headset that doesn't need a phone or a high-end gaming PC. You simply slip it on and get into virtual reality. It really is that simple. You do need the companion app on your phone first, which will make you log in. You'll also have to grant location access and pair the Go to your Wi-Fi. Once you've done that, and inserted and paired your controller, you're all good to go. There will be a little video that tells you a bit about safety, but that's it. That's how simple it is to set up. We found the Go to be a mostly comfortable experience, mirroring the comfort of the Rift. There are also rubbery eyeglass spacers should you want to wear your glasses in VR. You can even get prescription lens covers to slot in should you not want to wear glasses or contacts. The 5.5-inch, 2560 x 1440 display is 538ppi, which is about what you can expect from some of the higher end mobile VR headsets where you have to stick in your phone. It does have a slightly larger field of view than the Gear's 101-degree field of view. There's also refresh rates of 60Hz and 72Hz - developer's choice. The viewing experience is crisp and good, and there's also spatial audio so you don't need to wear any headphones or anything like that. Foveated rendering is also on board, so it can lower the quality of the content in your peripheral vision to get more from the Qualcomm Snapdragon 821 that's powering this thing. If there's a downside to the Go, it's tracking. The headset is only 3DoF, which means it'll only track you in three directions. That's less than the other big standalone headset on the way, the Lenovo Mirage Solo. The controller fairs better at 6DoF, and it's light and works well. The big upside to Oculus is that its ecosystem is pretty robust. There are over 1,000 apps and games available to you for the Go. Now you're not going to get some of the more high-end experiences, like Robo Recall, but you're not going to be hurting for content. Oculus' home screen is also probably the best in VR, even on the standalone Go. Finally, you're going to get about 1.5 hours of battery life if you're gaming and 2.5 hours if you're watching videos. The basic version comes with 32GB of storage, you camp bump up to 64GB of storage for a cool $50 more. The Go sits firmly in between the high-end VR headsets and the mobile headsets. It's going to give you a better experience than the mobile headsets overall, but it's not going to measure up to the pure power and high-end experience of the big headsets, so it sits here in the middle. Daydream isn't just about mobile headsets like the Pixel-powered View. Instead, it's a VR platform that now includes a whole new segment: standalone headsets. These are headsets that'll use a technology called WorldSense to be fully wireless and smartphone-free. No need to plug them into anything, no need for sensors or trackers. It's all handled by the headset itself. And we've seen the first of these in the flesh: the Lenovo Mirage Solo. The Solo boasts a 2560 x 1440 resolution and 110 degree field of view, so despite being untethered it still delivers a respectable performance. While it offers 6DoF tracking, the play space is only 5 metres in diameter right now. We hope that Google's WorldSense opens this up in the future. The Mirage Solo also has an accessory called is the Mirage Camera, a VR shooter with dual 13-megapixel fisheye lenses and 180 x 180 degrees field of view. But you don't need the snapper if you want to get into the Daydream headset action. Because of just how expensive it is to invest in high-end VR, companies have worked hard to bring us affordable VR that can run on those handy supercomputers we all carry around in our pockets. Thus, here are the best headsets you can slip your phone into. They're generally wireless and many are under $100, so it's a whole different ball game to the beasts above. Be careful though, certain devices only work with certain phones, so check before putting down any cash. Samsung's Gear VR doesn't look much different year-to-year, but the Korean company has given it enough of a boost to keep it on the top of the mobile VR heap. However, it did skip out on updating it in 2018, and the 2017 edition is the latest version. It's getting a little long in the tooth, but it does now come with a controller. Of course, the visual experience of using Gear VR will depend on which Samsung smartphone you use. There are some features that'll give you a good experience no matter which Samsung handset you've got, though, like a wide 101-degree viewing angle and a dark tint to reduce glare and reflections. You'll also need one of the compatible Samsung phones, which includes the Galaxy S9, S9+, Note 9, Note8, S8, S8+, S7 and S7 Edge. If you've got one of those, this is definitely the best mobile VR experience you can get. After making its debut in 2016, Google's mobile VR headset is back, not with a bang, but with plenty of small tweaks that make Daydream View an even better portal into VR. For starters, the new model has upped the field of view from 90 degrees to a full 100, with some new custom fresnel lenses and a new fabric that's more textured, less Sunday-sweatpants. The new strap distributes the weight more evenly too; these tiny modifications all add up for a more comfortable experience. Daydream comes with a 3DoF (degrees of freedom) controller and supports most smartphones, but the quality of VR will vary depending on the phone you're slotting in there. While the quality of games can't compete with the big names, the Daydream platform has consolidated over the past year with a respectable lineup – including Wareable favourite Keep Talking & Nobody Explodes. Google wants to make virtual reality as accessible as possible, so enter Cardboard, a literal piece of cardboard that folds into a very portable VR headset. You can strap it to your head, you can hold it to your head – it doesn't really matter because all it cares about is giving you a quick, cheap and easy way to dip your toe in the VR waters. Surprisingly, the VR is actually quite good. It's incredibly easy to share with people too, since they can just press it up against their heads if they want in on some tasty VR content. It's also compatible with most smartphones, including iPhones, making it a good choice for anyone who is looking to experience VR without too much of a cost. We admit, because it's… cardboard, too much use can take its toll. There's also a bunch of unofficial Cardboard headsets, but you might as well get the real deal from the Big G. It's really better than you'd think – honest. And don't forget to take a look at the best Google Cardboard VR apps and games. The sneaky underdog of the mobile VR world, the Merge delivers everything you want from a mobile headset. It works with a wide variety of smartphones, including iPhone. It's made out of a soft foam, so it's both comfortable and light. It's also got a bunch of doodads to help you customise your mobile experience. Adjust the lenses all you want, click two buttons to interact with your content; pop out the front window in case you ever need to use it for mixed/augmented reality purposes. Speaking of which, Merge now also sells the AR Merge cube, which lets you put mixed reality experiences in the palm of your hand. Everyone is excited about VR, which means – naturally – that more headsets are always coming. In fact, we've really only just begun. Below, we've picked out a few headsets that are headed our way in the future. As you'll notice, some of them are beginning to play with the idea of what a VR headset even is. Once known as Santa Cruz, Oculus' high-end standalone headset is now reality. The Quest was announced at Oculus Connect 5, and we've even tried it. It's got new controllers that are positionally tracked and four wide-camera sensors on the front of the headset. The big feature is 6DoF, which means you can move around with mostly total freedom. There's built-in sound that's louder than the speakers on the Go. You're also getting the same 5.5-inch, 2560 x 1440 display that's on the Go. Plus, there's 64GB of storage for games and entertainment. Oculus' high-end standalone headset, the Santa Cruz, is getting closer and closer to reality. One big new feature is Oculus Insight, which is the new tracking system that uses those four wide-camera sensors. Insight can track everything in your space, from objects to people to walls. Not all of those features will be live at launch, but know that the Quest has some capacity to get better in the future. It also has the potential for arena-scale room scaling. In our time with the Quest, we've found it to be an excellent standalone experience. Unfortunately, there's still some time before it's released. It's shipping in Spring 2019 for $399. Crowdfunded on Kickstarter, Pimax's new 8K VR headset is aimed at solving two VR problems: motion sickness and not-so-great field of views. It does this by going wide with a 200-degreee field of view, which is closer to the human field of view of 220 degrees. It also has two 3840 x 2160 displays. Both of these things mean a more immersive experience, and having spent time with the somewhat bizarre-looking headset we can say that this feels like it's pushing VR forward in a huge way. In fact, we found it difficult to go back to a Vive or Rift after experiencing the larger field of view in the Pimax 8K. Fans have long wanted the standalone Vive Focus to come west, but when it did it came with the catch that it was designed for business and developers. So instead, HTC has announced the Vive Cosmos, a higher-end, consumer-friendly standalone system. The headset, which will launch later this year for an as-yet-unknown price, is primarily designed to be used with a PC, however HTC has suggested we may be able to use it in some sort of standalone capacity - possibly connected to a smartphone. The messaging around this is a little... vague... so hang tight for more details down the line. The Cosmos comes with two 6DoF controllers too - an improvement on the Focus's 3DoF - so it's more "complete" than most of the standalone headsets. There's also a handy flip-up visor for jumping in and out of VR. HTC says it'll start shipping development kits in early 2019, with pricing to come later this year. Eye tracking is the next "big" thing for VR, and HTC is getting in early with the Vive Pro Eye, an - you guessed it - eye-tracking version of the existing Vive Pro. HTC is harnessing technology from Tobii, a leader in the eye-tracking space, to open up new ways to play. Eye tracking not only offers a new way to interact with VR worlds, it also makes use of foveated rendering, a technology that only sharpens the part of the picture being looked at, leaving the rest out of focus. The result is a more realistic VR experience and less demand in computing power. The Vive Pro Eye will launch in the second quarter of 2019 - no word yet on a price. The Fove 0 differs from the likes of Oculus Rift and PlayStation VR because it offers a special eye-tracking technology. Not only can this be used to make games responsive to your eyeline, but it can actually create a more natural depth-of-field, which VR can't currently do. The Fove setup is an 5.7-inch, 1440p display; a 100+ degree field of view; 70fps frame rate; and eye-tracking measured at 120fps. With the redesigned developer kit, gone are the big side panels and quite a lot of the heft of the last prototype design. The company promises the new model offers "dramatically reduced weight, size and overall wearability, as well as better production efficiency." You might have to wait a bit though – Fove hasn't confirmed plans for the consumer version just yet. There are few worse feelings than putting on a VR headset and having someone else's sweat drip down your face. That's why, if you're likely to be sharing your headset with others, we'd recommend some sort of cover. The company VR Cover does exactly what it suggests, selling covers for the Rift, Vive, Gear VR and Windows Mixed Reality headsets. You can get a couple of machine-washable covers or, if you prefer, some cheaper disposable ones. According to CEO Stanislas Chesnais, the 3DRudder was designed for "existing games where two hands aren't enough [for] VR, where you don't actually have any solutions today to move in a nice way while sitting." A circular device that you control with both feet by tilting in the direction you want to move, the 3DRudder's latency-free design means that response to your movements is instant and requires little thought. "It's like in real life," says Chesnais. "When you do something [like] set the table… you don't think about your feet moving around. Your hands are what matter." It's not without issues though. We've already discussed VR exercise equipment as a promising concept let down by being such an expensive, bulky and sweaty process. But if you really want to "get in" the game, and you have space, hopping into an Omni could be pretty neat. We've tried it since its early days at CES and it's been able to stick it out through the years, improving the base, harness and shoes to ensure the best possible experience. Once you've tried proper eye tracking in VR, you won't look back. You don't just get real-time eye control reactions, which means avatars that are more like you in social VR settings, but it also opens up the possibility of foveated rendering. 7invensun's aGlass eye trackers slot into Vive headsets, and they come with three types of myopic lenses (200-, 400-, and 600-degrees). You'll also be able to get customised lenses for whatever your needs are. You'll be able to order them soon.